/Design Tools - Backgrounds /How do I add a background? To add a background to your design, follow the steps below. Locate the Backgrounds icon on the left side of the Design Center. It is the second icon down after “Trim”. You will see two tabs in the Background toolbar that appears: Solid Color and Image Backgrounds. For more on choosing a Solid Color, click here. Click on Image Backgrounds. This will bring you to a library of our available backgrounds. You can either scroll through all of our available backgrounds, or search through them using a keyword. 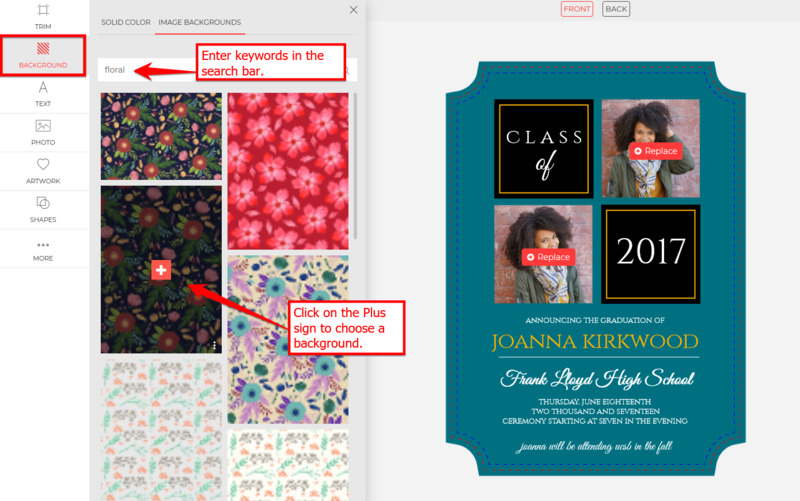 Examples of keywords are “floral” (for a floral background) or “kraft” (for a neutral, tan background). When you find a background you like, hover your cursor over it and click on the Plus sign that appears. This will add the background to your design. If you don’t like the way it looks, you can always click “Remove background” which will appear above the Backgrounds library once you select a background.